We are at the cusp of crowning the Season 9 winners of So You Think You Can Dance. Resident judges Nigel Lythgoe and Mary Murphy, along with guest judge Christina Applegate, are on hand to help guide America in choosing its favorite male and female dancer. This week, the remaining contestants dance three times, including a solo and two duets. We also get a peek at their family lives, as the loved ones of each contestant give a little bit of insight into each dancer’s personal life during a brief video montages. The first to take the stage is Tiffany Maher, who tears up the dance floor with Season 2 winner Benji Schwimmer in a flipping, dipping, jam-packed, high-energy jive routine. The number receives, as Cat would say, “a standing O.” The reaction is well deserved. Tiffany is punchy and stays on par with her swinin’ partner. “Absolutely tremendous,” exclaims Nigel. Reigning SYTYCD champ Melanie Moore returns to partner with this season’s dark horse, Cole Horibe, in a Sonya Tayeh jazz routine. Sonya wants to show a “softer, more uplifted side” of Cole. In these technical contemporary pieces, Cole needs to work on completing his lines through his feet. The positions are there, but often his feet aren’t shaped (something Christina notes as well). However, it was nice to see a different side of Cole and, as Mary says, he truly “commands attention on stage.” He has many dimensions to his presence and abilities. Ballroom bombshell Witney Carson joins Season 8 all-star Marko Germar for a ready-for-the-altar Ray Leeper contemporary routine. Considering Witney’s dance style of preference is ballroom, she has some great balletic lines and executes clean positions in her pirouettes and lifts. The judges love the chemistry between the two dancers and have been impressed by Witney’s versatility throughout the competition. Thankfully, Christina takes the time to comment on the “hair-ography,” which is a distracting element of many SYTYCD routines. All-star Comfort Fedoke returns to dance with Cyrus “Glitch” Spencer in a loaded Christopher Scott hip-hop number. This is some challenging choreography, even for the strongest of hip-hop dancers. 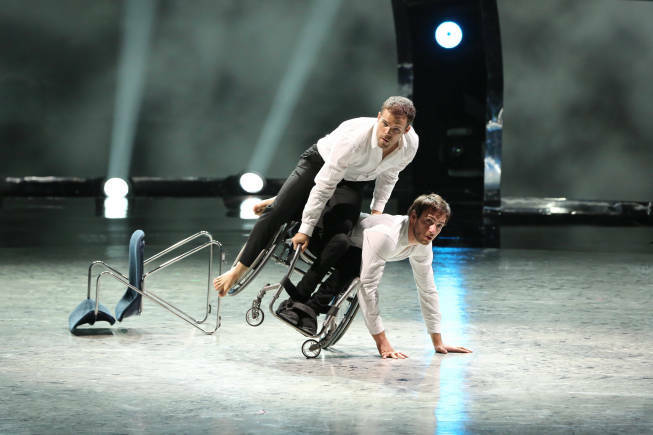 The two’s crazy animating, breaking, popping, locking, and hip hopping drives the audience and judges to their feet. Christina tells Cyrus, “that was carved out for you…I think you’re so fantastic!” There’s no doubt, America loves this kid and this is his best routine on the show to date. Witney and Chehon dance a tame cha cha, which leaves the judges wanting so much more. Much of the partnering is rough, including a missed lift and fumbles on many of the grips. Mary acknowledges how much Chehon struggles through the routine and feels the number doesn’t do Witney justice. She’s an incredible cha cha dancer, yet, for most of the routine, she’s in the air and not on the ground showing what her hips are capable of. It wasn’t either’s shining moment. Eliana and Cole partner up for a combative Mia Michaels contemporary routine. It’s a good partnership, one not yet seen on this season. The routine is full of interesting concepts, lifts, weight shares, and transitions. The judges find it mesmerizing and powerful. Now it's time for a guest performance by Axis Dance Company and then the results. This week, the judges have no say as to which dancers go home and which dancers stay. It’s 100% up to America’s votes. Of the ladies, Tiffany is the first to find out she is in the finale. The second girl into next week’s finale is Eliana, which means it’s the end of the line for Witney. For the gentlemen, Chehon is the first to coast into next week’s finale. The final dancer through is Cyrus, so we say goodbye to martial artist Cole. Remember, next week’s episode airs on Tuesday, September 11. Tune in to see Eliana, Tiffany, Chehon, and Cyrus compete to become the next winners of SYTYCD!